Just when you thought beer geeks couldn’t get any geekier, there’s a new niche beer geek. We’re the guys you see at brewery anniversary parties looking for the special glassware to commemorate the event, or seeking out the Three Floyd’s merchandise tent among all the beer whale carnage for the annual Three Floyd’s/Intelligentsia taster glass. We’re the glassware geeks. So where did we come from? 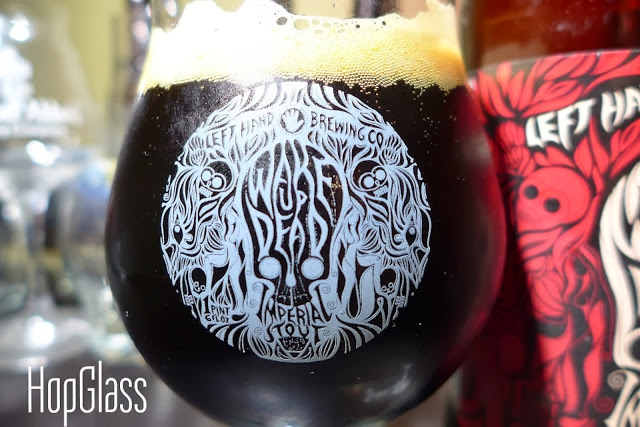 I’m sure there’s always been a few of us around, but as the scene has exploded and new breweries open every day, there’s been a proliferation of brewery glassware and naturally an increase in collectors. Certain breweries produce a vast variety of glassware, such as Stone Brewing Company who as of this post had 18 different glasses in their online store and at their last anniversary party produced no less than 4 different glasses just for that event. 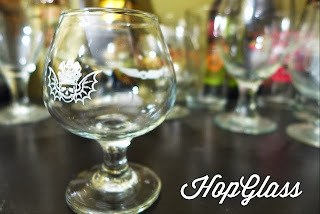 Unlike beer, breweries can ship you their glassware directly if they’re willing to (not all are for various reasons) and in some cases it’s as simple as visiting their online store. 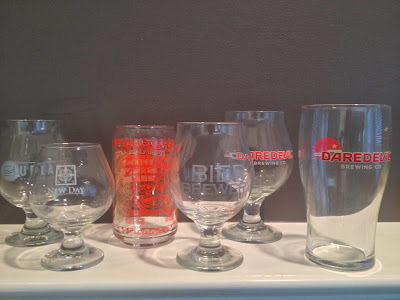 Also, breweries like New Belgium, Samuel Adams, and Terrapin commonly give away glasses at events. The abundance of available glasses makes it seem like an easy item to collect, but that’s not always the case. First, beer glasses aren’t as widely distributed as beer and are generally only available at the brewery, sometimes at liquor stores, or at specific events. Secondly, certain glasses are only made in very limited numbers. For example a new brewery out of Oregon only made 71 of their tulip glasses available, and a very popular Oregon brewery made 500 glasses available for their most recent anniversary party. 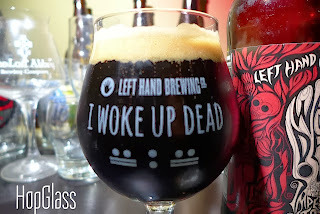 Glasses like the Cantillon Iris wine glass, Left Hand Brewing “Wake Up Dead” snifter (I get unsolicited offers for mine all the time), Pretty Things “Our Finest Regards” wine glass, and several Three Floyd’s glasses are what we call glasswhales; the rarest of the rare. These glasses are rarely seen and usually cause a frenzy when they are offered up for trade, and their owners can demand a lot in return. The extreme rarity and/or demand for certain glasses has spawned a burgeoning glassware trading community somewhat similar to the beer trading community. Just like with beer, people mule, hoard, and ransom glasses and unfortunately as the scene grows we get more and more people doing the latter. Trading glasses can also be more difficult than trading beer; because the community is newer and smaller, consensus values on rare glasses and trading protocols haven’t been firmly established. It can get complicated too when there are multiple versions of a glass and there’s not a common lexicon among traders or no fancy beer label to simply reference. This has bitten me before when I expected a certain Russian River “-tion” glass to arrive in a trade, but got the wrong glass because the trader incorrectly identified the glass he sent me. 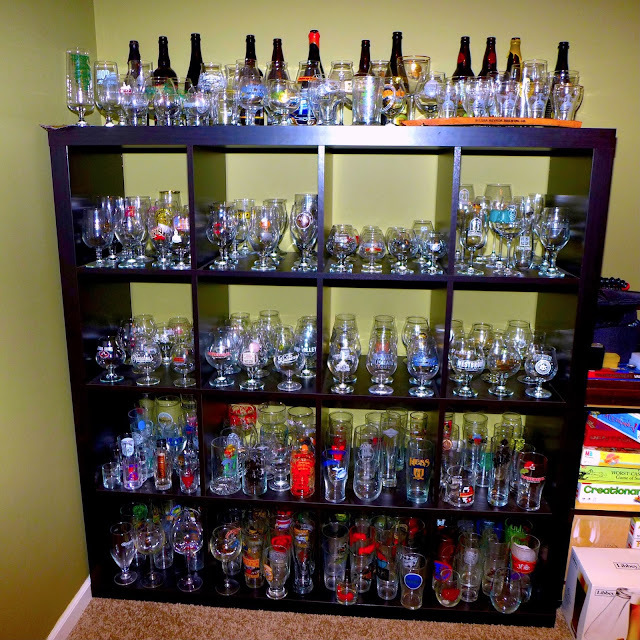 That said, I have found the glassware trading community to be very generous and very welcoming to newcomers. I’ve shown my collection of glasses (pictured below) to many people and among the many compliments and exclamations of “my significant other would kill me!” I frequently get asked: “Why do you have so many glasses?” While I can only truly answer for myself, I have several reasons that I believe reflect other collectors’ thoughts as well. First, some of us are just habitual collectors; whether it was baseball cards, action figures, dolls, or probably what a lot of you reading this now collect, beer, there’s always some focus that provides the “thrill of the chase.” Secondly, there’s something that just feels right about having the matching glass to go with the beer and so this means you need a lot of glassware! Lastly, and probably most important for me, there are memories attached to the majority of my glassware- when the beer is gone the glass remains! You’re probably wondering “Who is this guy? 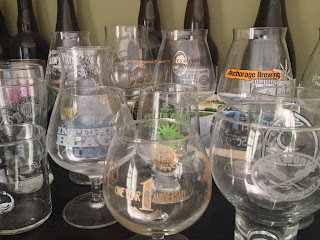 How do I know he has street cred?” well in my collection I have over 250 pieces of glassware… It’s gotten to the point where I’ve had to institute 2 rules (there are occasional exceptions made): 1) I’m not allowed to have glassware from a brewery that I have not visited or have at least had beer from; 2) No more shaker pints! It’s the standard conical glass you see everywhere- I hate those things and I don’t buy them anymore, but I’ll talk more about that in another post probably. -Most of the other breweries will have some type of shaker pint to purchase. So the next time you see that crazy guy at Three Floyd’s Dark Lord Day (because there’s only one right?) looking for that year’s special event glass, point him in the right direction and think about getting one for yourself, because it won’t come cheap when you want the proper glassware for your Dark Lord.